Can’t we have some new hymns?.. ones that we all know? “Well – we could do… I don’t know… maybe, off the top of my head… ‘Hark the Herald’ to the tune of ‘The Birdie Song’ ? It certainly fits, listen..
(Mrs Forthright’s glare could strip paint). I can’t possibly go into the hymns versus choruses arguments here – it is neither a new debate, nor one which will ever have a satifactory conclusion. Each style becomes a valid form of worship in the hearts of the worshipper, however simplistic the language and the music or complex and skilfully-written the offering may be. I remember clearly in my younger days, one service where for “When I survey the wondrous cross”, I changed the traditional tune of “Rockingham” for “O Waly, Waly”- both very beautiful and appropriate tunes for this hymn – or so I thought! It seemed to have gone down swimmingly and passed without comment, until I finished the final voluntary, and turned round to see a deputation of two gentlemen wishing to speak to me. I quickly realised that Mr Allin-Tweed, the first gentlemen, was not there to enquire after my well-being or to share any Sunday-morning pleasantries. I gave up attempting any verbal response other than the occasional “but..”, and all eye contact with my assailant ceased – I resorted to humbly looking at my dirty scuffed organ shoes and listened to proclamations of how I would probably never work again in a church, and after that, would suffer in eternity for such a sin. When I bravely did catch his eye again, he had a look in it that would have not looked out of place on “Crimewatch”, and so I was mentally preparing my acceptance speech for my inevitable P45. Without formalities, he marched off leaving me to contemplate a possible career change. A very valuable lesson to learn – how to exasperate and exhilerate at the same time! So – how many tunes can you fit to the ‘old words’? Just take “While shepherd’s watched”, for example. There may be outrage if you strayed from the traditional ‘Winchester Old’ (written 1592), in your church, but next door they may prefer ‘Christmas’ (from ‘Siroe’ by G F Handel 1728). Or ‘Cranbrook (1805) – the legendary ‘On Ilkley moor baht ‘at’ (one of my all-time naughty favourites!). So it comes back to YOUR decision, based on your experience, years of training, musical tastes and most importantly, your wifes list of favourites! So – next time you are tempted to change the tune or introduce something new – tread carefully, prepare – and have the car revving up in the churchyard ready for your escape…. And remember, Mr Allin-Tweed may be watching you…! “The House of the Rising Sun” tune is said to be based on an old English, Irish or Scottish folk tune brought over to America. It is quite possible it has been used in centuries bygone for hymn singing. I have been playing for services for 72 years, been there, done that and have several tee shirts of various denominational hue. The padre actually persuaded me to play for his services at one Army camp I was on during National Service in 1950. You can imagine the comments that arose in the barrack room. Currently playing from ,Singing the Faith, in Methodist church. Tunes are vetted at choir rehearsal on Friday evening. Anything too difficult for our congregation is usually altered with the Sunday’s preacher consulted or anything new is usually first verse by choir congregation join for verse 2. A very civilised arrangement. At our Presbyterian church in Maryland, we’ll sing anything new as an offertory a week or so before singing it congregationally. If the music isn’t found in the hymnal, we also put the music in the bulletin so that everyone at least knows the melodic direction. That arrangement seems to be working well. I think “Just as I am” will fit to the tune of “Last of the Summer Wine”. I do like Crimond but the tune I was taught at school was Brother James’ Air and I should like to sing that occasionally. HYMN BOOKS – well now as a young Anglican Christian growing up in south west England UK in the 1970s – we sure did mix the hymns and their melodies. English Hymnal (green), Songs of Praise Hymnal (blue), Sankey Hymnal (red), Psalter Hymnal (red), Ancient and Modern hymnal and the list goes on. At school we used a different hymnal to the one in a local “low Anglican church” which was different to the local “high Anglican church” and when we joined forces (quite a lot back then) with a local Baptist church their hymnal was different to the local United Reformed church and I expect that the hymnal in a Church of the latter day Science is different to the Jehover Witness hymnal and both different to the Salvation Army hymnal and so on. Some hymns that I recall having different melodies (harmony) “Oh Jesus I have Promissed”, “At the name of Jesus”, “In the bleak mid winter” and so on and so on. As an organist thank goodness there are plenty to chose from. So I entered the Church looked at “My” pew, and somebody was sitting in it. So I sat at the back. The reading was from the Apocrypha, not the Bible proper, there was announced that a Baptism would take place during the service, ( said child could already be heard) A retired slightly senile minister was officiating, and to top it all The Crimond was replaced with some jazzy tune from TV. So my offering was reduced considerably and I left in a considerable temper, drank port after lunch, had row with wife (lost) went to bed swearing I would never enter that Church again. Woke refreshed for Evensong. wonderful! I have just started as an accompanist at a new church and after my first Sunday playing met my very own Mr A Tweed who opened with the dreaded words… “If I may make an observation…” Thanks for your excellent and entertaining blog (I was weeping with laughter at the scratch Messiah stuff…) it really cheers me up when the Tweeds and Forthrights are getting me down! Interestingly, ‘Hymns & Psalms’, the UK Methodist Hymnbook published in the 80s, uses ‘Lyngham’ as a tune for ‘While shepherd’s watched their flocks’. ‘Lyngham’ being the tune commonly used for Wesley’s hymn ‘O for a thousand tongues to sing’. I mean, it fits, but it is a little odd. Odd. It is a wonderful tune. Thanks for the wonderful humour about our profession. 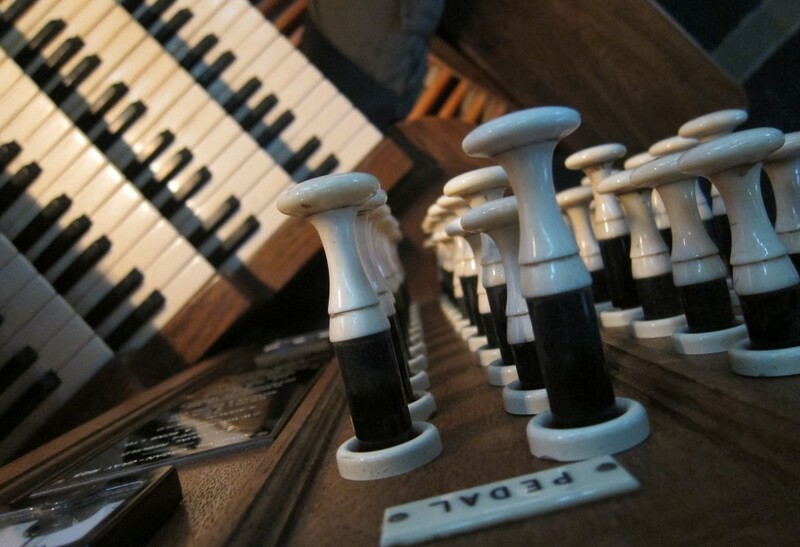 I’ve been an organist for centuries and have experienced many of incidents you cite. Keep writing! I was taking my choir through hymns for last Sunday’s Eucharist, one of which was, perhaps inevitably, “Brightest and best.” NEH provides two tunes, one of which we were using though at least one lady did not know it. In going through it with everyone, I couldn’t resist playing over all the different tunes I know for it, having encountered them in various choral foundations since boyhood. There were six in all, and when I’d finished one or two choir members chimed in with still more different tunes that they knew or remembered from long ago. What would Mr Allin-Tweed make of THAT, I wonder? I am an Anglican organist and was helping out in a local Baptist church. The first hymn was “Praise to the Holiest”, so I started the play over of Somervell in E flat. Half way through the play over I realised that this was none of the three tunes (Gerontius, Richmond and Biling) on offer in their book”! I think we used to sing this as a grace before meals at summer camp. I was taught this by the present Bishop of Liverpool. Very funny bro! Not trying to be modern but from your actual sis. What fun! Personally I’ve always wanted to sing “Oh little town of Bethlehem” to the tune of “The house of the rising sun”, which I think would be brilliant, but fortunately (or not) I’m not in charge of hymns at my church so I doubt it will ever happen! ‘There is a green hill far away’ goings extremely well to ‘The House of the Rising Sun’. My husband, in his tenure as the youngest ever organist of a small but well attended Methodist church did just this. They refused to sing. In his youthful naïveté he did not know or understand the original lyrics of “The House of the Rising Sun “. In the Bleak goes very well to Puff the Magic Dragon. We discovered this when out carol singing round the parish, and could not decide whether to do Holst (Cranham) or Darke, and then we could not recall quite how either one started. Someone struck up with ‘Like this, isn’t it?’ and we all said ‘Oh yes’, and sang it through to the end, and then realized that it was PTMD. Of course, if you believe that Puff the Magic dragon refers to reefers, then (as with House of the Rising Sun) you may not wish to try this at home. Happy New Year! An organists’ life is at times “Not a Happy one”! But what fun! And then play the tune that’s not a happy one…. My favourite ‘new tune’ that incurred the displeasure of one of the congregation was Luther’s ‘Ein Feste Burg’. Given that we have others who are suspicious of anything that smells of Rome, that was proof (not that any were needed) that it’s impossible to please everybody. Indeed, if we do please everybody, we’re probably not doing the work of the church. Do keep these posts coming. I was in hysterics just over the names ‘Mrs Forthright’ and ‘Mr Allintweed’. which version of Ein Feste Burg was used, original sychopated or Bach harmonization? Thanks Adrian, will credit you and put in your email address. So true Adrian – I changed “Love Divine” from our normal “Blaenwern” to Stainer’s “Love Divine” (which I was bought up with and staple of a million weddings when I was a chorister) and didn’t half get some stick from the congregation! ‘Love Divine is, for me also the ‘proper’ tune, Mark. But I would like to hear it sung more often to Purcell’s ‘Fairest Isle’ which, according to the compilers of English Praise, was the tune Charles Wesley hoped it would be sung to. wedding. Loved it! Everyone had a great sing.! join in with ‘Love Divine’ tune!! so joined in lustily at the second.!! West Wales, when Blaenwern was switched to the far superior Stainer music during the November 11th service. Never mind a couple chaps. This got as far as the local council! Blaenwern has a big range and can be a strain for a small congregation without strong singers.